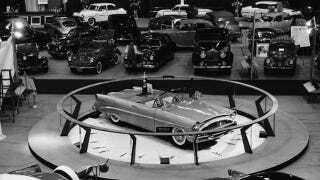 The Packard Panther was a concept car built in 1954 to point towards the future of a company that barely had one. Packard released a series of concept cars in the 50s in an attempt to project what was next for the company and inspire car buyers. Unfortunately no amount of concept cars could save Packard, the last car was built with the Packard nameplate in 1959—a few years after the last "real" Packard of the company's own design rolled off the assembly line. Even so, it's hard not to applaud Packard's design efforts when looking at the very unique Panther concept. Although four Packard Panther concept cars were built, the example seen here on the floor of what we believe to be the 1954 New York International Auto Show is the first one built and features an earlier taillight design. All 4 Panthers featured the company's 359ci straight eight but the first two were also fitted with a McCulloch supercharger which bumped the engine's output to 275 horsepower. Amazingly all four Panthers are still believed to exist with one example selling at auction in 2009 for $700,000.